It is a date to focus on sharing information, support and personal stories. So, how can you get involved in #WDSD15? We tried to think what to do to have fun with socks. My son suggested sock puppets, I though I might dust with socks on my hands and my daughter thought about wearing socks in her hair. In the end, as we had bought a funky purple microwave, we tried to see how many colourful socks we could get in the box. Daddy did not quite fit and fell backwards showing the bottom of his mucky socks. It’s a way of showing our individual differences, and of gaining attention so that you can engage people in conversation about the day and leave them a little wiser about the condition. Donate as you Text SOCK £1 to 70070. Just £1 is all it takes to make a difference to the Down’s Syndrome Association. Money goes towards medical research, support for families and educational resources as well as campaigns that benefit us all. Downs Side Up is fundraising on their behalf this year and I am proud to call her my friend and to have shared a cuddle with the lovely Natty. I am also proud of Mia for her great work on the awareness-raising book I Love you Natty. The family are giving a donation of £2 from every hard copy of I Love You Natty sold during March to the Down’s Syndrome Association and you could do worse than buy a copy for your school or home. It’s also now available as an iBook. The focus from the charities this year is on keeping active for health and wellbeing. 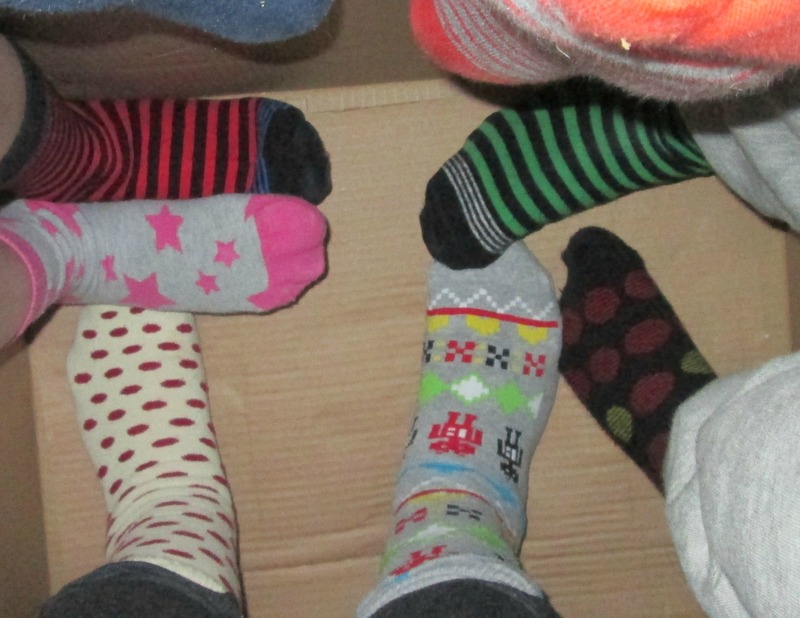 You can share your photos and stories, as well as your sock selfies using the hashtags #lotsofsocks #WDSD15 and #TeamT21. My youngest son always has to be different but says you get a thumbs up for him for putting your best sock forward for such a great cause.